Go read the book NOW. Well, sometime in the next couple of years. That’s how long it will take Miramax to make the movie. Which you will also want to see. But don’t, don’t, don’t deprive yourself of the pleasure of discovering this story of the boys in the boat via paper. Need some reasons? 4. It’s a character study of the most inspiring kind, appealing to both females and males, old and young. Joe Ranz, the rower who dropped his story into Brown’s lap just months before dying, was left motherless at five, pushed out of the family by his stepmother at 14, and learned that he could only rely on himself to survive. Then, four years later, he had to completely un-learn this lesson in order to be able to trust his teammates, keep his seat in the boat, and help propel them to victory. 5. Brown’s level of researched detail is astounding. He says a reader once challenged him about his description of the UW coach chewing gum during a tense race–halting the chewing–then chewing again at the end. “How could you possibly know that?” His answer: about 25 eyewitness accounts, sportswriters of the time. He claims nothing in the book is made up, and I see no reason not to believe him. If I were critiquing style, I would say that the book’s narration felt a little grandiose in places, a bit inflated. But that’s nitpicking. It’s mostly seamless, and the racing scenes are riveting. So here’s my prediction: This movie, when it’s made, will be the next Chariots of Fire. Everyone will see it. Everyone will hum the inspiring theme tune. Everyone will cheer when it wins an Oscar for best…whatever. Democracy vs. Fascism. Individual Grit vs. the Team.The Greatest Generation…as boys. In a boat. Have you read it? Please give your impressions HERE! Or chime in with some other greatest-story-never-told. 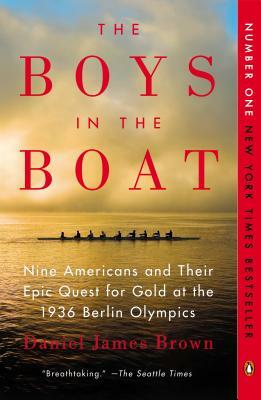 This entry was posted in Book Reviews and tagged 1936 Olympics, Berlin, Chariots of Fire, crew, Daniel James Brown, Hitler, rowing, The Boys in the Boat, University of Washington by gretchenwing. Bookmark the permalink. Haven’t read it yet, but other friends have and echo your praise. It just moved up on my to-read list and has been added to my give to my grandchildren to read list…Many thanks!! Almost finished with it. Saving the last pages for a special quiet time alone. Best book I’ve read since the one by John K……..about the climb of Mt. Everest. Unbelievable determination…..please let me never complain about life being hard. Adding to my list! Sounds lile an inspiring ride! It’s become the “it” book of my community. Fun to watch it spread! And, as you’ve noted, a major part of the story is the simple modesty of the “boys” in question. So many ways they could have publicized their amazing exploit, and none of them did.